A nice ride today to the coast and completing a loop back to where I had been one month ago. Mostly flat terrain with small villages along the way. Rice, sugar cane and hay. Seems like more communal work in the fields. I'll typically see half a dozen to a dozen people working on some task in the fields. Often all of one gender. In a few spots I was back to an area where the road was being used to dry hay, so riding through hay several inches deep. Road was generally smooth with occasional rough areas. Left Kanchipuram and found my way outbound towards Chengalpattu. Friendly people again with multiple "hello" and "how are you" queries. It was busy for the first 6 km and then after that intermittent through the small villages. Breakfast had been early, so I made good progress while it was still cool. 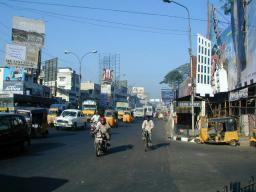 Crossed the busy main Chennai road at 36 km by about 10 am and then into Chengalpattu. Looked like some nice large temples here. From here outbound towards Tirukalukkundram. A split in the road with both sides saying Mamallapuram, so took the one through town of Tirukalukkundram. Made last bit into Mamallapuram before noon and found a place at the same hotel again. Nice to be once around. Seems like many non-Indian tourists here. The hotel says they have connections with office in Amsterdam that books tour groups directly to their hotel. After lunch went looking around and to the Five Rathas (chariots). Beautiful stone structures here that have been worn by the weather. Also took a good look through the shore temple. The shore temple was built in 8th century and still has beautiful carvings as well as overall outside texture. It is almost in the ocean, but now protected by a rock wall. It is also a World Heritage Site. Otherwise a quiet though hot afternoon walking through Mamallapuram. I've seem major highlights of town, though have booked for a rest day tomorrow to take it easy here by the sea before heading back to busy city of Chennai. 66 km today, 28373 km cumulative. 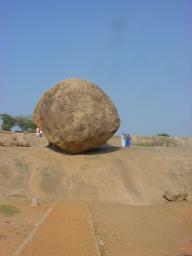 A quiet rest day in Mamallapuram. While it was still cool, I took a walk around the whaleback rock formation here. Interesting rock carvings telling a whole story and with many figures displayed. Also multiple mandapam temple entrances carved into the rock. On top, a nice view from a rock temple on top. There seem to be quite a few goats, dogs and pigs running around here as well. I've met a few vendors and talked with people on the street. I was asked twice about my height and answered in centimeters. Both time was asked about feet and inches. This confused me slightly since India is a metric country and otherwise the matrimonial pages that come out on Sundays list height in cm and weight in kg. Similar to US, also listed are some physical characteristics like "thin". Religion, caste, sub-caste and "biodata" are sometimes listed. Quite prevalent is either direct mention of monthly salary or at least a hint such as "works for MNC". Twice in the past day, I was asked if I was alone and then not married and then why not. In India someone my age would be expected to be married. As it got warmer, I walked past local tourist office. They ran tours to nearby crocodile bank and tiger cave. Cost was Rs 75, though I ended up paying for four since this was minimum number. Crocodile bank is 15 km away and is a breeding area for several species of crocodiles. Saw several large holding pens including two with over 500 crocodiles each and one that held a giant crocodile named "Jaws III". Also about a dozen species of alligators, crocodiles, etc. Also at crocodile bank was an exhibit about venomous snakes. Here were 131 different snakes, each in clay pot with cloth secured over the opening. The handler would take out some pots and then show the snakes as they sat up and hissed. Saw interesting display of two cobras here. Apparently they extract some of the venom here for use in medical and research purposes. On the way back from crocodile bank was a brief stop at Tiger Cove. A giant carved rock here with eleven lions (not tigers) and small mandapan. Here was also a taller rock that was climbed and used for signal fires and lookout purposes and also a small temple. On return it was getting hot so time for lunch and time to browse on local ISDN lines here. As it got cooler went bargaining with several of the many rock carvers here. Ended up purchasing 20 different small items, though my total purchase cost wasn't quite 1000 Rs (I'm sure I still got taken). Just for fun I did enquire about larger pieces. One thigh-high nice carving was Rs 15000 and they could arrange shipping for an additional Rs 15000. This was their opening price and I didn't try to bid further from there. A three meter high dancing lady was Rs 3 lakh (or Rs 300,000) and I didn't ask about how much it would be to ship it overseas. Otherwise quiet and nice time wandering around town. Several nice restaurants here and a relaxing feel to this small town by the sea. 0 km today, 28373 km cumulative. A ride back to the big city today. Mamallapuram was a nice quiet place compared to some of the traffic I encountered in the last 20 km into the city. I packed up my souvenirs and otherwise packed and cycled out from Mamallapuram to the main road. Still a very nice wide and smooth road with occasional beach attractions of sea lions, crocodiles, dizzee world or just nice resorts. Slight headwind though all was riding fairly quickly. I came past the toll booth and it was now open and collecting tolls, though not from bicycles. At 33 km was end of the official toll road and roughly start of the busy road. The road became narrower and there was a steady stream of traffic. Occasional obstructions like a truck parked in middle of the road or an ox drawn cart going along made everything quite congested as traffic slowly tried to file past. Lots of honks again! A little further came over a bridge and into the city proper. I wasn't quite certain of my navigation, but generally tried keeping straight ahead with occasional stops to ask about my proposed destination "Hotel Savera". In two spots it was one way, though bicycle traffic still continued straight ahead. Surprisingly easy to find my way to the hotel. This hotel was the second nicest place I've stayed so far (Madauri was 3x costs here, so by far the nicest). However, thought I'd get a few nights of being tourist in the city and staying at nice place. Now a chance to look further at attractions in Chennai. Only four sleeps until I start heading back. Mixed emotions there. A bit excited to be going home again, though also saddened to see end of this nomadic existence ahead. 51 km today, 28424 km cumulative. A few easy days to look around Chennai and otherwise relax before going back to US and to work. The part of Chennai I'm in is a bit tough to walk around. Main roads have a lot of traffic and the 30 cm sidewalks are a bit intermittent. I'm seeing motorcyclists with face shields for first time, presumably for pollution. There are plenty of taxis and auto rickshaws, though the auto rickshaws seem to be a little more expensive here than elsewhere I've been. The hotel is very nice (though not a top five star hotel which I avoided, since it feels more awkward to stay in place that treats you live visiting royalty). Clean rooms with no ants, mosquitoes, mice or other pests. I've got a fifth floor room with nice views of the city. Hot water and not just in a bucket, but also from the shower head. Central air conditioning and three different restaurants usually serving buffet meals where you can sample different food...All in all, somewhat of a "bubble" from rest of India. While it is pleasant, the "bubble" also feels a bit isolating from rest of India, and particularly from how I've been able to travel this past month. Local people I interact with are uniformed and doing specific service roles. There is even a high fence around the complex as if to keep India out... So, I try walking some along the main streets. In the back streets I find more "normal" and what feels to me "usual" interactions and also somewhat more comfortable. I realize how fortunate I've been to see parts of south India the way I have this past month. On Sunday afternoon I had also had a tour that helped break out of the bubble. While it failed on my original objectives, actually found it interesting for strange reasons. The hotel had a tour desk where I went with my Lonely Planet guide. I showed a Chennai city tour listed and asked if he could either book this tour or have something similar. No problems, what we decided was I'd make a list of places to go they might add some and for reasonable fee, would go via taxi to those places. We scheduled it for five hours from 2 pm to 7 pm (I'd wanted earlier but this seemed to work better). I made my list with eight places listed and met the driver, Pandia, when he called at 1:30pm. We drove to Sri Kapaaleeswara Temple, a beautiful temple dedicated to Shiva. Shiva's wife, Parvathi, is here in form of a peacock. I was told story was that Shiva and Parvarthi had a spat and she came in form of peacock here before they reconciled. The temple itself was closed, though the beautiful goparam tower was visible from outside. We drove past the oldest church in Chennai, the Luz Church and then stopped at San Thome Basilica. A beautiful church, this has a crypt where the disciple, doubting Thomas was buried. A steady stream of visitors was filing down to the crypt, touching it and filing back. Otherwise a large and beautiful church. Next stop was Fort Saint George, the original British Fort established in 1639 for British East India company and which established Chennai as administrative and trading center. After brief stop, went via downtown and Parry's corner. We mostly whizzed past several items on my list: the government museum, high court building. I tried taking a photo from zooming taxi. The planetarium was closed on Sunday and Pandia now indicated it would be too late for the snake park. Pandia did slow at the prison and suggested I take a photo, though I declined. Instead Pandia decided to take me to a few handicraft emporiums with expensive rugs, silks, sculptures, furniture, jewelry, etc. I suspect it was partially a misunderstanding as he asked me if I'd like to see a gallery (as we were zooming past the museums). The first handicraft shop was nice, though had much finer (and more expensive) goods than I'd otherwise seen. The staff patiently took me to four floors and I politely declined to take more than a viewing interest. From here we went to a second handicraft shop with much pushier staff. They just couldn't see why I wouldn't impulse buy a US $3,000 kashmiri rug as they kept unrolling these carpets. Ok, how about jewelry...and out came fancy stuff? Went from there a bit aggravated at the pushy staff and thought we were done with handicrafts when Pandia took me to a third shop. Fairly quick and then done. At this point we'd stopped at three of the original list of eight, zoomed past two more and for various reasons couldn't go to the other three. Pandia asked if I was interested in seeing a Hindu festival with his family. That seemed interesting, so we rode into smaller and more crowded streets. Stopped at a small shop where two technicians were checking a TV circuit card and working with soldering iron. Behind this was narrow pathway with rooms on each side. The second room was the home for Pandia, his wife and 2 1/2 year old son. We'd wait there for a while until the festival. I felt honored and definitely broken out of the "bubble" in this home. Total size was ~12 ft x ~10 ft. One side had a small stove, shelves with pots and pans and nine large plastic water jugs. The well was nearby and they put filter over the jugs when pumping water. A second wall of the home had wardrobe with clothes and a 2001 calendar with Ganesh images. A third wall had shelf over the door and few more things. All was secured with padlock over the door. Motorcycle was parked somewhere outside. Made me compare with my own 12x10 room in San Jose, filled with material possessions I've stored there for the past year. Pandia asked for my address and I put it into his book with other addresses from Australia, France, US and elsewhere. His sister came over. While she spoke no English, it was explained to me some misfortune left her without husband and with three children. We went walking through the neighborhood with Pandia's son and then stopped at his brother's place. Pandia's brother was a doctor who worked providing poor people medical services for a group named "Think Positive Welfare Trust". Another exchange of addresses. Felt a little like Pandia was playing at heart strings of "rich American visitor" with these introductions, though it was interesting to see this life. As we came back, Pandia's wife had changed into beautiful bright sari and we then rode over into the taxi to the festival location. (It continues to impress me how much I see women in bright saris and also with flowers in the hair, regardless of economic status). A nice pavilion upstairs where I was introduced to another brother. There were many people out around, though festival wasn't going to start for a while. In fact, we waited here for over an hour when Pandia decided it might become too late and so suggested we drive back to hotel. From one view one would count this "tour" as a failure. Only saw 3/8 of the places on the list, spent too much time in overpriced handicraft shops, didn't see a festival and felt a bit manipulated as a rich tourist. Ironically, I wouldn't view it that way particularly as it gave me a sense of life and existence of taxi driver and his family and very much broke out of my bubble. True to my heartstrings, I even gave him some extra tip on completion of the tour and a little for his brother the doctor. On Sunday I also picked up my laptop PC and visited briefly with Tara's father. Much appreciated to have kept things there. On Monday I walked to the HP/TCS offices in Chennai and visited with a team of engineers I had worked with prior to leaving on this trip. Many from the original team left and were replaced with others. However, still nice to catch up briefly and to see the products well taken care of. Monday afternoon I walked from TCS/HP offices to the Valluvar Kottam. This is a huge 4000 person auditorium monument in honor of the poet/saint Thiruvalluvar. It is huge building with all 1330 verses of the Thirukkural poem on granite pillars and with huge 30 meter stone chariot. The overall building and monument is quite impressive. After Valluvar Kottam, I walked down the busy Anna Salai road and stopped briefly at Spencer's market. Three stories of shops here including a nice book store with many later computer texts. Discovered editions for sale only in India at prices about 15-20% of what the same technical book would cost in California...oops, some more heavy luggage :-). Otherwise some nice relaxing time in Chennai. Both internet cafes and ATM machines have proliferated tremendously since I visited here two years ago (see http://www.mvermeulen.com/india for that trip). Internet cafes are also less expensive here than elsewhere I've been. On Tuesday morning I updated things for the web before checking out of my bubble hotel and getting everything on the bike to ride to Hotel Mars for a last night before a scheduled Wednesday flight. 0 km today, 28424 km cumulative. Many Indian hotels work on a 24-hour system, rather than a specific checkout time. Hence, I had more than 24 hours at Hotel Mars and some time to look through nearby town of Pallavaram, read, browse the internet and relax. Pallavaram has a nice church with associated school. Uniformed students waited outside for a flag raising before going into school. Here and most places elsewhere there seem to be school uniforms and students are separated by gender. My bicycle box was carefully kept here, so it was retrieved by Das and I repacked everything and took a hotel van to the airport. Checkin happened very smoothly. Once again I was told it would cost extra (6900 Rs) for my extra bag/bike and once again this was waived (this time as "special LRT allowance"). I've seen huge contrasts in most everything. Excellent roads and the worst surfaces. Paid 80x for my most expensive accommodation vs. the least expensive and 40x for the most expensive meal vs. least expensive. In India you can live like a British Raja and stay in finest places (though be isolated). India is jumping straight from literacy (65% at present) into computer literacy with more Oracle/XML/WAP/VB/etc posted than elsewhere I've been... but also a third of the people who do not read/write a native tongue. People I've met are extremely helpful and friendly. While they sometimes have a laugh at my expense or pose with me for photos... I never felt threatened ever... just quite out of place at times. Friendliness is particularly apparent out of the most touristy places where I tended to get a "tourist shell" to ward off a progression of aggressive sales types and hustlers. In countryside very curious and very helpful. There is tremendous culture and history in south India. I get the sense the British period was only a few hundred years, and not much compared to ages of temples and former dynasties and empires. Hindu temples are surprisingly open to foreigners who don't necessarily understand (or sometimes respect) religious significance. I felt challenged in different ways than riding elsewhere this year. Much more than elsewhere, it was physically aware of body and potential for sickness... rather than just mechanical issues. Overall, I very much enjoyed my travels though India and recommend south India as a destination for bicycle tourists... particularly for those open to a bit of adventure, a bit of culture and a bit of a challenge. As for me, I expect this won't be my last tourist trip to India (though it may be a while). Next time I'm intrigued to try a different region such as Rajasthan in the north... though I probably need to pick up some Hindi first. At risk of leaving some out... a thanks to some who emailed specific India advice or provided assistance while in India including: Subbi, Suresh, Sourabh, Johnson, Shaji, Tara and her parents, Srini, Venu, Udayan and Sunil. Thanks! 0 km today, 28442 km cumulative. Today was a 40 hour day... including a 16 hour time change and two overnight sleeps. A short overnight flight brought me back to Singapore Changi Airport and an eleven hour layover. Fried rice for breakfast but first cheeseburger in over a month at lunch. Also felt nice to trust the water from drinking fountains. Changi Airport seems to be well set up for stopover passengers. There is a large set of shops that I browsed. Also posted was a free two hour city tour that I signed up for at 10 am. Our city tour brought us out through immigration and to a waiting bus. Nice drive to tall downtown buildings. 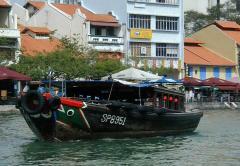 Singapore is built on a set of islands and 4 million people live in an area of 862 square km. Much of this is concentrated in high rise buildings around the city; some are privately owned but the government also subsidized many 99 year leases. The city name was derived from "singa" or lion, so this is the lion city. Chinese are the largest group but the city also has large groups of Malay and Indian. Our tour brought us to small "bum" boats and a 20 minute cruise on the Singapore river before boarding the bus and returning to the airport. Nice trip overall, particularly for free. I believe the sponsors (tourist department and Singapore Airlines) hope to encourage longer repeat visits. In afternoon, I played the "What's your range?" game with 25 other contestants. We had to guess the value of a knight in chess, when a noble prize was awarded for tuberculosis research and other questions. I got correct ranges right for 8/10, but unfortunately these ranges were sometimes too large. Person sitting next to me won with 6/10 right but tighter ranges. Finally boarded plane in late afternoon for four hour flight and stop in Hong Kong before long cross-Pacific flight to SFO. Surprise! My parents had let me know my brother Rob would greet me, but neglected to mention they'd driven out from Colorado as well. Nice! It certainly helped to not bicycle from the airport. It was nice to get home after a long day and a long and wonderful trip.